Here’s a quick and easy delicious dessert that Minty and I made yesterday for Sunday lunch. It’s inspired by an Eton Mess – traditionally strawberries, meringue and cream – literally all mixed up together. 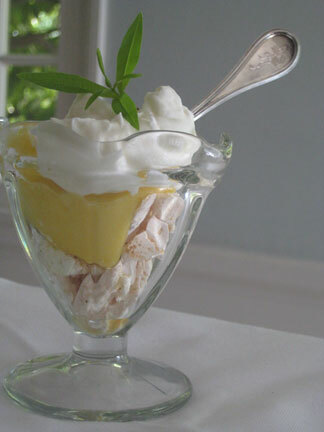 In a pretty sundae glass layer small pieces of meringue, a generous spoonful of lemon curd and a dollop of whipped cream. Place a small delicate sprig of lemon verbena on top (no trees! *) et voila! *during Hettie’s Home Economic’s O level she was berated by her teacher for using too much parsley as a garnish – the teacher shouted ‘No Trees!’ as she proceeded to pull Hettie’s generous parsley sprig off the top of her dish.